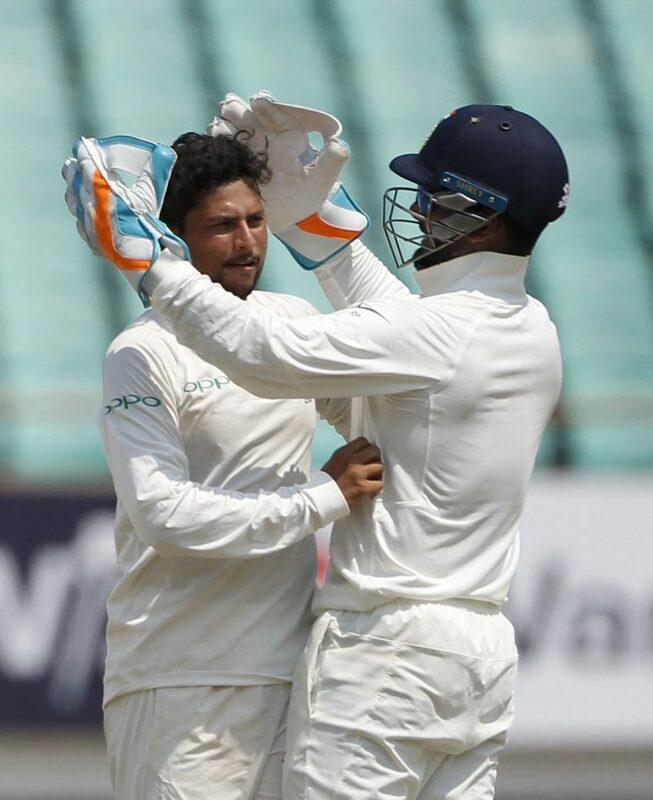 On Saturday, the Indian left-arm chinaman bowler Kuldeep Yadav bowls superbly in the third innings of the first Test of two-match home Test series against Windies at Saurashtra Cricket Association Stadium (Rajkot). In this innings, Yadav managed to take his maiden five-wicket haul in a Test innings. 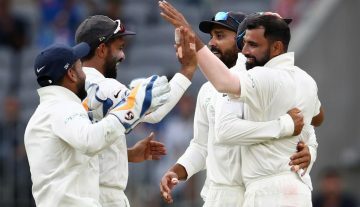 In the reply of India’s first innings total 649/9 decl., Windies were bundled out for just 181 runs in their first innings where Kuldeep Yadav ended with the bowling figure of 10-1-62-1. After forcing to follow-on, Windies’ struggle continues as they are batting on 185/8 at the end of the second session of the third day of this Test match. Kuldeep has impressed in this innings and he has a bowling figure of 14-2-57-5. Playing his fourth Test match and bowling his seventh Test innings, Yadav claims his first ever five-wicket haul in a Test innings. It is Kuldeep Yadav’s third five-wicket haul in the international cricket career. In every international cricket formats (Test, ODI and T20I), Yadav has claimed the five-wicket haul for once. As Kuldeep Yadav claims all the five-wicket hauls in international cricket in 2018, he becomes the first ever bowler to claim at least one five-wicket haul in each of three international cricket formats (Test, ODI and T20I) in a calendar year. Only the second bowler to claim five-wicket hauls at least once in each of three international cricket formats (Test, ODI and T20I). Indian right-arm pacer Bhuvneshwar Kumar was the first man to achieve this feat. The third spinner to claim five-wicket hauls at least once in each of three international cricket formats (Test, ODI and T20I). The other two bowlers in this list are Ajantha Mendis (Sri Lanka) and Imran Tahir (South Africa). The seventh bowlers to claim five-wicket hauls at least once in each of three international cricket formats (Test, ODI and T20I). The other six cricketers are Umar Gul (Pakistan), Tim Southee (New Zealand), Ajantha Mendis (Sri Lanka), Lasith Malinga (Sri Lanka), Imran Tahir (South Africa) and Bhuvneshwar Kumar (India). It's tea in Rajkot, and India are two wickets away from an emphatic innings victory in the opening Test. It seems Kuldeep Yadav is getting better after every match, whereas Chahal is going downwards, Kuldeeps hard work paying off and Chahal is more going towards style on his look, just like Vinod kamble.